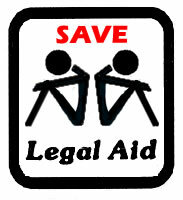 If you venture into the legal blogosphere right now you can see many erudite blogs about the Ministry of Justice’s proposed “reforms” of the legal aid system. I’m taking to blogging for the first time to add my voice to the dissenters. This is a difficult exercise. I am so incensed by the proposals and there are so many points to make that it is difficult to distil them down into any sensible article. I suppose the Powers That Be know that, as it helps them. If you can’t write your campaign slogan on a small yellow sticky note it’s going to be hard to win over the public.